As is usually the case in big ticket purchases, the best way to save money buying a new computer is not to buy one. The statement is obvious but it’s worth mentioning. If your current computer works fine, it can be much cheaper to spend money on upgrades than on a completely new machine. If you are still determined to purchase a new machine though, here are some things to help you minimize the impact on your budget.Figure Out What You NeedLaptops and desktops are available with all the bells and whistles imaginable. A serious online gamer may need the memory and graphics from the high end of the available spectrum. For most users, a much ... Read the entire article. There is no secret. I get more done because I work longer hours than most of you. Everyone sees me out and about during the week and people are always jealous, but they never realize the time I put in every single night when they are watching TV, and all the hours I put in during every single weekend when everyone else is doing anything but work. Having said that, there are a few little things I learned along the way ... Read the entire article. With the holidays quickly approaching, parents are starting to feel the pressure rise. The kids still expect to see a variety of gifts under that tree. However, with the recent economic upset, more parents than ever are experiencing serious stress in their family budgets. The good news is that you can have a nice holiday season without breaking the bank by learning the tricks that enable you to shop economically for Christmas toys. By making a plan and sticking with it, you may find that it isn’t as hard as you thought. Kids can only soak in so much fun before it gets overwhelming and you are wasting your money. Three gifts per child is a very doable number and is plenty enough to keep most kids happy. Many parent ... Read the entire article. This morning, our four year old daughter told me, “I don’t want a bunch of things for Christmas. I just want one thing: a pogo stick.” I paused to reflect on how delightfully easy it is to choose Christmas presents for little ones. We are constantly cutting back on the number of toys and parts and pieces that are so often underfoot in our home. The approaching holiday season has me thinking about how we can celebrate through giving, without increasing the volume of stuff in our home. As we discussed in last week’s 12 Weeks to a Peaceful Christmas task, the sooner we start gift shopping, the less stressed we’ll be when the holiday hits. So here are 10 clutter-free gift ideas for the little ones in your life. Financial Investments 1. Short-Term Investing For a child who is preschool age and older, partner together to work on a short-term ... Read the entire article. Often living frugally isn't about keeping up with the Joneses, it's about doing things that the Joneses would never think to do and being better for it. What are some of your frugal practices that set you apart from your neighbors?Here are some of mine:* use cloth ... Read the entire article. I love picking up some second hand clothes, furniture and kitchen utensils. There is just nothing better than going home knowing you paid pennies on the dollar for an item or that someone's mistake is your gain. Anyway, there are a few things I have learned from thrift / second hand shopping. Of course if you have anything to add, let us know in the comments below. Be Aware – Know store policy for returns (if there are any), sales and what tag colors may mean. At a local Goodwill store – red tags mean the item came from Target. Bring as little as you can and keep it safe; don’t leave your stuff unattended. The government has put together ... Read the entire article. You don't need electricity to do the laundry. It's as easy as riding a bike. My wife's 90-year-old aunt still washes her laundry by hand, and dries it with a wringer. God bless her. But if you're a little busier, you can keep your clothes clean with ... Read the entire article. Spending more on groceries than you'd like to? The problem may not be what you're buying, but how you're buying it. Consider this money-saving tip: Go for the lean cuts of ground beef. When you buy a package of 70% lean beef, 30% off what you're paying for is fat. When you buy 96% lean, only 4% of what you're paying for is fat - and that means a lot more ... Read the entire article. While many folks save money with coupons, especially in their grocery shopping, today, I'm going to show some novel ways to saving money with credit cards. But first, let's get this out of the way. Many folks have got into debt with credit cards and regard them with a degree of suspicion. If carrying a credit card causes you to overspend, then please do not carry one. But if you can manage credit cards, here is a list of ways ... Read the entire article. The state of California is making positive moves in that direction. The SacBee reports that "insurance Commissioner Steve Poizner released regulations permitting and authorizing mileage verification for pay-as-you-drive, without dictating what form such plans must take." The goal would of course be to reduce California's chronic traffic problems and improve air quality. If you drive less, you pay less. With our new launch of MileMeter 2.0, you are covered for six months. If you drive more miles than expected, you are still covered as long as you pay us promptly for the miles driven. You get the peace of mind of a traditional six-month policy, and all the savings and benefits of distance-based insurance. Win-win! You can pick, purchase, and print your insurance cards from the website, and the entire transaction requires only 5 minutes. The policy costs are quoted in cents per mile. You may purchase between 1,000 and 6,000 miles of coverage and pay in full at the time of purchase. So instead of paying a relatively fixed amount and then not saving a cent on insurance when you drive fewer miles, you would have an incentive to keep your mileage low. Of course the incentive wouldn't be so strong as to radically change people's habits, but in conjunction with other incentives (sticks AND carrots -- tax credits for public transit users and electric cars, a revenue-neutral carbon tax on fuel, etc), it could make a big difference. 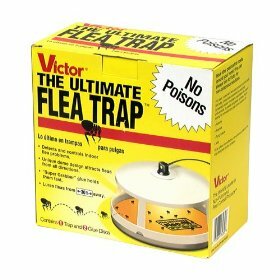 I just stumbled upon this product at Amazon.com, but after hearing several friends talk about the ordeal of their flea problems, I thought I'd share it to give all pet owners some hope and relief. The best part is that there's no poisons involved. Nothing to damage the health of your pets, children or you. And no residual toxins in the carpet or pet's bloodstream. I love a natural solution! And a frugal one to boot! This flea trap monitors and controls flea infestations. The patented design features produce the high efficacy of the trap. Lured in by the trap's color, the heat and light from the bulb, and the sweet odor inserted in the specially formulated sticky glue disc, fleas don't stand a chance. This flea trap lets pet owners see results. The non-poisonous and odorless trap enables safe placement around children and pets and comes fully assembled and ready-to-use. Refills are also available. Have you seen those vacuum sealers? They aren’t cheap enough for me. The prices range from $45- $400 depending on the model and how many extras you would like. I just can’t bring myself to drop that much money and break away from my low-tech version that works just fine for keeping freezer burn away. The good part of my low-tech vacuum sealer is that only need three things:" Read the entire article. We love finding computers in unique spaces that make them more of an heirloom item than a disposable tool. And here is one where you'll have no idea a computer is inside until you pop it open. One part neat upcycling, and one part late-1800s James Bond, this PC case is fantastic. Rob Higareda built a functional computer inside a trunk. Funny thing is, it's a new trunk made to look old. It would have been more fun if it had been found in a thrift shop somewhere - or even better, at a garage sale where there might have been a good story to go along with it - but when a Hobby Lobby ... Read the entire article. Planning to make pumpkin pies for Thanksgiving? October is a great time to pick up cheap pumpkins. Buy a few while you're at the store this week, and make all the pumpkin puree you'll need for your holiday dishes. ... Get the Recipe. If you live in the northern hemisphere, then it is likely that your garden is tucked up for the winter. However, this doesn't mean you can't enjoy freshly picked herbs. Many varieties will grow quite happily indoors on a sunny windowledge or porch. In addition to providing a source of fresh herbs, an indoor garden can look extremely attractive, and they are a wonderful introduction to gardening for children. You will need to find a sunny, well lit spot to grow ... Read the entire article. I have an old credit card account where my charging privileges were revoked because I was having trouble making my payments. I have since then paid off the card and it is at a zero balance. Do I now close the account? Would it help my credit more if I left it open? I am trying to rebuild after years of bad credit decisions. Deciding to close a credit card or leave it open is a tough decision. Unfortunately, it sounds like the credit card issuer beat you to the punch. Chances are they ... Read the entire article. This is not your common colloidal silver. We're very excited that Nature's Sunshine has offered this product on sale again. We've had so many customers stocking up on this to support their immune systems. I love to save money and see others save money also. View Silver Shield sale prices. View all product sales at The Herbs Place. Read more research, information and view a video about Silver Shield. Try asking your local nursery. If one isn't available then do a web search on growing plants for your zone. And as a last resort just observe the ... Read all the responses. Now architects and designers recognize their usefulness as building blocks for homes, offices, apartments, schools and more. This home in Quebec was built by a couple intent on reducing the amount of wood that goes into building homes and also saving money. View photos and rest of the story. You constantly write about how having a notebook in your pocket all the time helps you in life and saves you money. I get that you can write down your ideas in it all the time, but I’m not a creative type. I don’t see how having a notebook on me at all times can save me money at all. Aside from the fact that I’m able to use the notebook to write down my ideas – my career’s bread and butter – a pocket notebook constantly comes in handy for many other financial reasons as well. (FYI, I usually just keep a simple small Mead reporter’s notebook in my pocket, along with a good pen that doesn’t run out of ink.) Here are fourteen ways I use that notebook to directly save money. ... Read about the 14 ways. Learning how to make homemade cloth diapers, even fitted ones, is probably a lot easier than you think. If you have minimal sewing skills and can follow simple instructions you can finish one in less than two hours. Once you get the hang of it you can finish one in forty-five minutes or less. View the Slideshow How-To. Now, Nancy has published her own thorough guide to the green life. Go Green Save Green includes chapters on everything from transportation to church, with practical tips and charts on how one can begin living a conscious and communal life. “My main goal is to have people love God and love their neighbors by taking better care of creation,” said Nancy. “That’s absolutely it. It’s about my journey, and sharing it with other people. Read the entire article. The next ABC+D Approach to Natural Healing Webinar is offering the first two sessions of this class absolutely FREE. In these sessions Steven Horne talks about the difference between treating disease and building health, by explaining the ABCs of natural healing (Activate, Build and Cleanse). This is valuable information is enough to get anyone started on the road to helping themselves be happier and healthier. And, it's all free! The preview sessions will be held December 8th and December 15th. There is an early session at 7:00 Eastern, 6:00 Central, 5:00 Mountain and 4:00 Pacific and a late session at 9:30 Eastern, 8:30 Central, 7:30 Mountain and 6:30 Pacific. Shop at The Herbs Place for any products mentioned that are of interest. Wholesale prices every day and fast shipping from 4 warehouses. This website is maintained by TheHerbsPlace.com. What's On Sale Now? I want to ask if any of you know what to do with soil that is holding water. I planted a dogwood tree 3 months back and saw it was doing poorly and when I removed it I had to 'ring the roots out.' Everytime I watered it and fed it the liquids were choking the roots. I want to put a dogwood in the same place but I really don't know what to do with that much standing water except to build it up with a berm. Do any of you have any ideas on the subject? A. Most problems with water and trees and bushes start with too small a hole dug with a shovel thus packing the outside edges as the next shovelful is levered out. The water has a hard time getting past this wall of packed dirt. BUT, first you need to determine if the surrounding area just plain holds water due to hardpan soil or a high content of clay. OR is ... Read the entire article. Q. Can anyone tell me how to grow a plant from a mango seed. I love mangoes and buy a lot of them and it would be nice to get the seeds to grow. I have rooted Mango seeds by washing the seed and putting it in between a dishrag and ... Read how to grow Mango from seed.